December may have been a "short" month but the lack of smoke and reasonable health made up for it. December is usually a down month but after such a bleak November, there was nowhere to go but up! Some rain issues and I didn't skate at all the last six days but I still managed to crack 400 miles. Only 360 miles, well short of the normal goal of 400 miles. Still, that's not bad for January, which is typically wet. 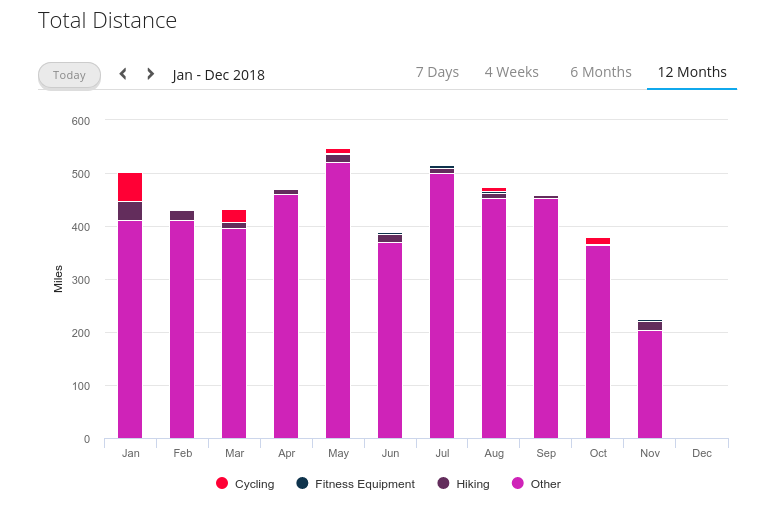 I hit 500 miles in January 2018 but that as weirdly dry. This one was bit wetter than usual including one one week where I couldn't skate or even bike to work at all. A couple of Sunday workouts were washed out as well. It does get to me after a while. It is amazing what going out on a good long skate can do to my mood after I've been inactive for nearly a week. February starting off as more of the same. This weekend and Monday look to be washed out completely. I might be able to bike back from work on Tuesday. I left my bike at the office last week after a surprise morning shower. I had intended to skate. Bikes handle rain much better than skates but the risk of getting a flat is high during those wet rides. Wow, you got an EARLY start on your stats this month! I envy the miles you got. I had a great January as compared to the past 6 months. Best miles since June last year @ 327. Have not broken 100 since June due to weather and a heel injury that required rehab. So THIS January I got 147miles, mostly on quads with new boots - Antik Jet Carbon - on my old quad frames and wheels. Break-in was fairly easy so now I have confidence up to about 30 miles. I use the quads for wet days as they actually have a lot of grip on rain-soaked surfaces or soapy water from our street cleaners. I doubt I am ever going to skate 3000 miles in a year like 2017 but I believe my remaining interest should get me near 2000 this year, weather permitting, new job notwithstanding (assuming I finally land the one I want which is AT the local park! Wow, you got an EARLY start on your stats this month! It rained all weekend and my non-skating plans also fell through. I had time. Nice new ride. Was it just raining too hard on the first day? You did say you use the quads on wet days. I've toyed with using my 110mm Storm Surges and "rustproof" bearings on wet days since I will probably never race on them again. However, I don't completely trust the bearings really are rustproof. Further, I don't have a complete set so I would need to mix with regular wheels, making sure the sizes are compatible and the right bearings are mounted. What do you do for bearings in your quads? I generally won't skate in a torrent. I use my longboards for that - half as many bearings! Due to the humidity here in New Orleans many days the ground is just damp from either dew, fog, street cleaners, or past showers. My quads grip, my inline skates do not. A heel injury from pushing longboards and standing on concrete at work forced me to take a long break from pushing the boards - so I switched to the quads instead. What do you do for bearings in your quads? Not a short answer. In general, I use cheap Chinese bearings that cost 10 cents each and keep them lubed with either Bones Speed Cream (when new) or BreakFree CLP to recover the few that get water damaged. When they get really bad I just throw them away one by one and keep replacing them with a new one as needed. It is really hard to ruin a well lubed bearing with my system. I made two very long videos on the bearing care issue. Quite an experiment but well worth the time as I save so much money on expensive bearings that don't last any longer than the nicer cheap ones. I tested 8 different lubes and three types of bearings. The nicer bearings with rubber shields actually hold water INSIDE. The cheap ones with metal shields do not. So that's your first hint. Next rain-out you can check them out. First one is 35 minutes, second one is 18 minutes. In summary...keep them lubed. BTW... I NEVER clean bearings. I just throw them away as they go bad which is very seldom. I can get 2 years out of a set and MAYBE lose three or four. Even skating through deep puddles. But don't just hang up your wet skates and try to deal with it a week later. Address the ones that get noisy or freeze up within 12-24 hours. As they get too noisy, toss them. 10 cents each. Often a noisy bearing will calm down after a lube and one session, so not too hasty about ditching them. Obviously if you are racing perfect bearing quality matters. If you are training or commuting, who cares. They just need to roll freely and not sound like a jet engine warming up. Last edited by Joey; February 4th, 2019 at 08:55 PM. 132 miles of skating for Feb 2019. 100% on quads with the new boots. SO MUCH RAIN! I have been skating in wet conditions thanks to all of the urethane in contact with the road surface using the quads. Also my quads seem to be less sensitive to all of the twigs blown down by passing storms than my blades. I would have about half the mileage had I not purchased the new boots - so much more control than the old ones AND the carbon soles don't care about getting wet like my old leather soled quad shoes. I am still commuting by bike when the weather is really bad, and also use my bike to transport the skates do distant parks. However, I do not record those miles. It's laziness. And no one wants to see five bike trips 1-2 miles each every day running errands. Or my commute 4 miles each way. Last year at this time I was working on 46 days of skating in a row with only 2 washouts. This year I am lucky to string 2 sessions together back to back. Terrible. The only real bright side is the new quad shoes are wonderful and have vastly extended the types of weather I can safely commute or hit some of the better parks with wet surfaces. February was super soggy. Maybe not as wet as New Orleans, but in California, February is usually when the rainy season dwindles down and then stops. This didn't happen. Three Friday Night Skates washed out. We got to skate the fourth but only barely. We were spritzed on intermittently throughout and had to shorten the route slightly to get out of the weather before it got serious. Three of four Sunday workouts were washed out. Hikes were cancelled. The only reason I managed two hikes is because I went hiking on a Sunday when it was too wet to skate. The first half of the month felt like the time of Smoke from the Camp Fire. The air wasn't bad. I just couldn't get out and do anything. I do not like this. Fortunately, it eased up a bit in the second half and the March rains (we don't normally have March rains) so far have been rather half-arsed. I should get my new Simmons speed boots this month. That should be fun though I really thought I would have this in early January. I skated 30 miles in my new quad boots this week. They are all broken in and plush now. My feet could have gone 50 miles I believe but the rest of me was very satisfied with a marathon + some. I now have confidence to tackle those marathon+ distances on the quads. My inline skates are quite capable of course but I am loving the quads because they are so sure-footed over damp/wet surfaces. As you stated, even though we are thousands of miles away, the rain has found both of us with a vengeance this year so far. 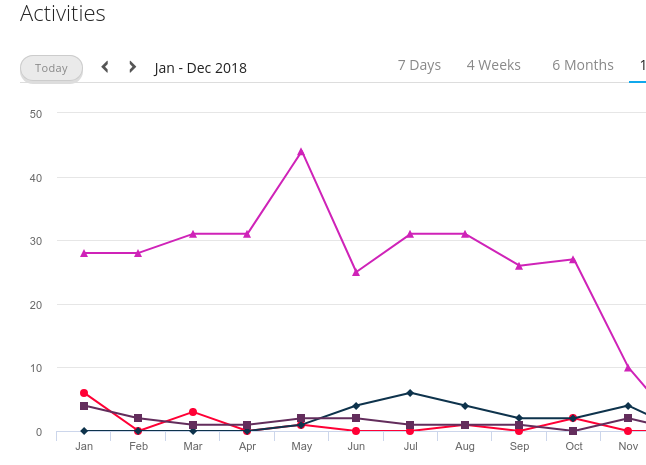 Best month since July 2018, but that's not saying much. 90% quads, 10% longboards, 0% inline skates this month. Might be changing jobs soon. Will get off at 3:30 pm instead of 5 or 7 pm. Also M-F instead of working weekends like I do now. Who knows if this will help or hurt my mileage. The new job is more physically demanding than my current job as well. Best I can do for now. March was dryer than February but actually wetter than a typical February. We even had some April showers, which is an absurd concept in the Bay Area. Between the rains, I managed the biggest totals since July, although only the highest skate miles since September. 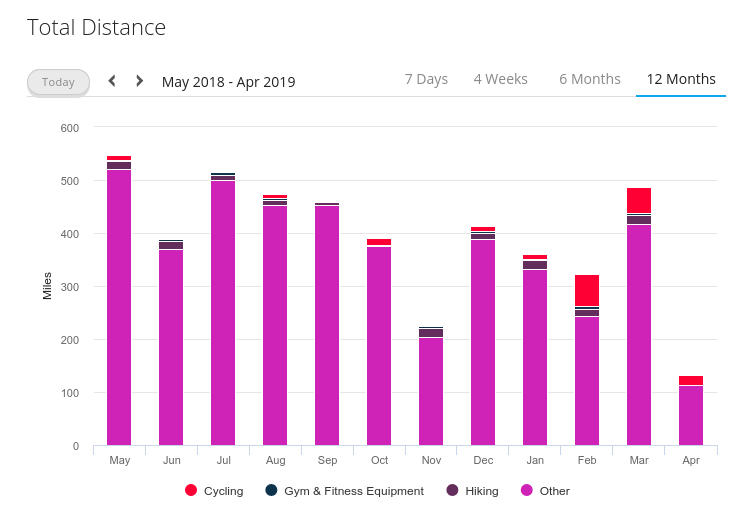 About twice cycling mileage as last March. The Simmons finally arrived. The break-in process is coming along. I managed about 50 miles in the new boots in March. This is good because I think my Pinnacles may be on their last legs. I just discovered that the clacking sound I've been hearing from my left boot for the last six months is the mounting blocks moving around. They've only pushed *in* so far rather than pulled *out* but, scary.